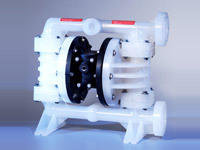 Our client in Mentor, Ohio wanted us to build and assemble plastic pump components for an air-operated double diaphragm pump it had designed. By way of injection molding (applying 8 injection molds), as well as secondary processes of CNC milling and overall assembly, we produced a pump out of homopolymer PP and PVDF with a total material thickness of .30″, a length of 20″, a width of 8″, and a height of 14″. Tightest tolerances for the air valve components fell within the range of +/-0.003″. All parts together weighed a total of 16 lbs. For more information contact Royal Plastics, Inc today, or consult the table below. All parts = 16 lbs.